Sotheby's Belgravia, The Property of Martin Battersby, 21 April 1978, lots 46 & 47. M. Battersby, The Decorative Thirties, London, 1988, p. 99. British Art in Industry Exhibition, 1935. 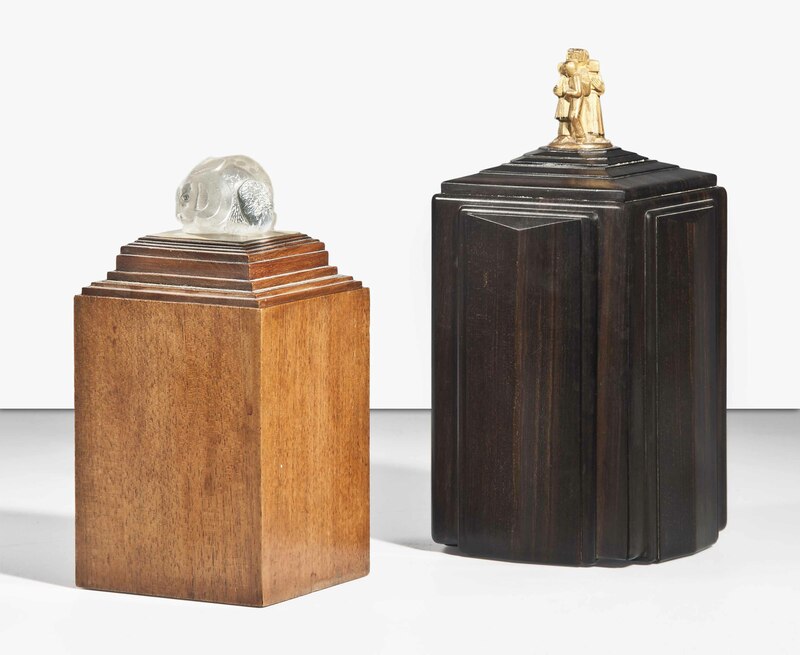 The rabbit finial seen in the present lot was the first use of Perspex as a decorative material, the result of an experiment by Capey, who used a sample block sent to him by the manufacturers. British artist and industrial designer Reco Capey studied art at the Royal College of Art and went on to become Chief Instructor of Design there from 1924 to 1935. He was Art Director of the British cosmetics firm Yardley from 1928-1959, and worked in collaboration with Emile-Jacques Ruhlmann on the complete redecoration of the firm's Old Bond Street offices and showrooms. Some of the furnishings for this commission were later presented by Yardley to Brighton Museum.